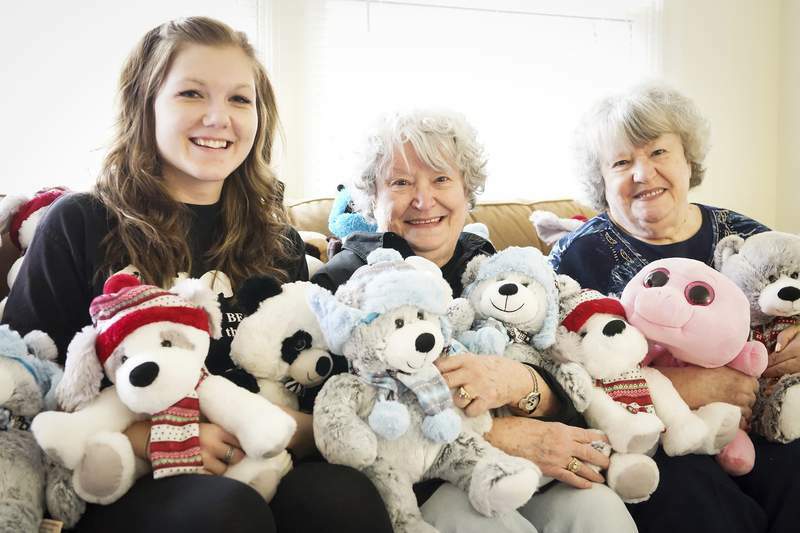 Photos by Mike Moore | The Journal Gazette Disorderly Bear Den members, from left, Cassie Crickard and founders Donna Gordon-Hearn and Phyllis Huffer collect teddy bears and stuffed animals to distribute to distressed children and lonely adults. Teddy bears from the Good Bears of the World are made specifically for the Disorderly Bear Den. Sisters Donna Gordon-Hearn and Phyllis Huffer are OK with sharing. After all, it's been part of their lives since they were born. Identical twins – Phyllis is older by 12 minutes – they share a birthday as well as a home on the northeast side of Fort Wayne now that both are widows. 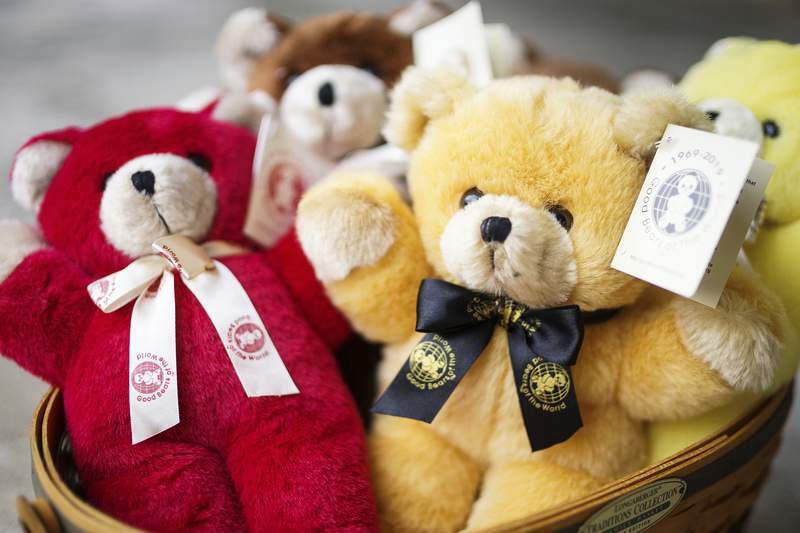 The 82-year-olds also share memories of growing up where they developed a love for teddy bears. “I can't ever remember being without a teddy bear,” Huffer says. It was their love of teddy bears that got them involved with the Good Bears of the World, eventually starting a chapter – the Disorderly Bear Den – in Fort Wayne. The group collects new and “pre-loved” bears and other stuffed animals that are in good condition and donate them to abused, traumatized or at-risk children and lonely adults. Anyone who has ever had a beloved stuffed animal or toy, knows the comfort that it can bring in times of trouble or sadness. The sisters also know as they relay donation stories such as the senior who clung to her new bear, naming him “Teddy,” and tales from first responders who say that a bear can bring a smile to a terrified child's face. “It's just something we do to give back,” Gordon-Hearn says. Huffer is the chair bear of the den, which was chartered in 2006 and is the only chapter in Indiana. The group has 25 members, ranging in age from 15 to 82, and includes several families. The group gets many of its donations by word of mouth, from organizations and churches that have bear drives. The den also participates in such events as the Komets' teddy bear toss, which last year netted the group more than 2,500 bears. The annual Komets event is actually one of its fundraisers. The group sells the bears before the game and then attendees, who oftentimes bring their own stuffed animals, toss the bears on the ice when the Komets score their first goal. The den collects the bears and then donates them to organizations, such as hospitals, churches, nursing homes and social service and nonprofit agencies. The sisters have been collecting teddy bears since they were little, Huffer says. She says their mother would get upset because the girls didn't like dolls. She remembers her mother unsewing the back of their bears and taking the stuffing out and washing the bears when they became dirty. She would hang them by the ears on the clothesline. Huffer says the sisters would sit and watch the bears dry because they were so particular about their bears. The sisters' home is filled with bears. There are stuffed bears, statues, items with bears on them and even a glass table top with a white bear underneath sitting in the living room. There are giant clear plastic bags filled with bears and stuffed animals in the garage. They are bagged up, ready to be delivered to different organizations for donations. Gordon-Hearn doesn't mind making the deliveries to places if need be. However, she admits that she's not sure how much longer she can keep going. She estimates maybe about 10 more years. “We're getting to an age that we need to slow down a bit,” she says. But that's where she hopes the younger members of the group will step up. Members like 22-year-old Cassie Crickard who joined the chapter three years ago after finding them on a volunteer match website. She says she was looking for something to do in the community and the Disorderly Bear Den appealed to her because of their mission with children. She is the group's publicity chairman, going to different organizations to talk about what the group does and organizing events. Gordon-Hearn hopes that such events will draw more members to the group, just like she and her sister were drawn to it years ago and now proudly call themselves life members.